Forum	> Content Revision board	> Possible NNT Upgrades? You can check in the Knowledgeable Members List for people that you can ask to comment here. 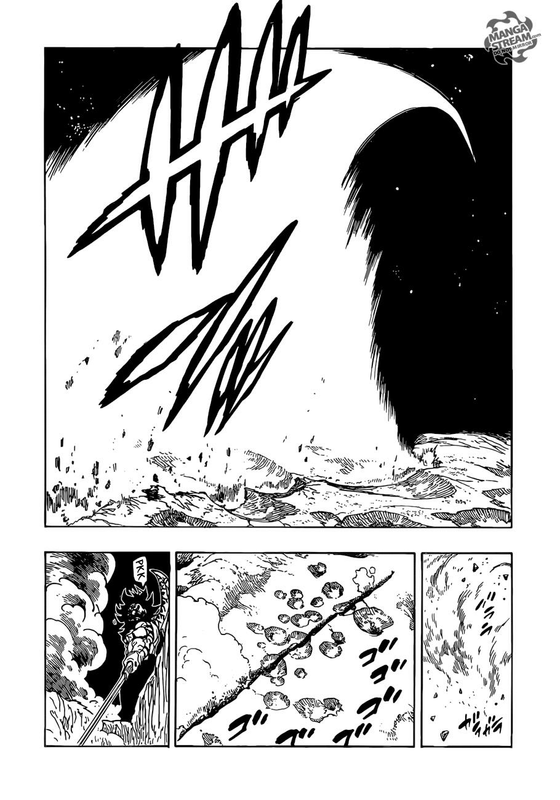 I'm not sure if i can accept this higher end since Base Chandler who should be comparable or superior in power to the Meliodas that did this feat did the High 6-C meteor attack after his power was boosted by the night, after the attack he said that this more of half of this power was wasted with the attack. I checked the chapters with Chandler’s fight and he never said he used more than half his power in that attack. He even commented on how those attacks shouldn’t have drained his magic. Than he said that Gowther and King’s combination attack dealt damage to his spirit which was basically a debuff that caused his magic to be lowered by more than half. What he did was not a casual attack and he was boosted by the night. Before the fight Cusack also commented on how the goddess seal significantly weakened them. And we don’t know how much the night actually boost a demons power. I think that statement supports the calc, I think I recall reading that part and was like " this is him weakened?" I'm not sure if they ever regained their full power back, it took the commandments awhile to do that, and this seal I believe was much stronger. So even now they are probably not at 100%. Well in chapter 257 Cusack said the Goddess seal is almost removed so even the Base Chandler and Base Cusack that have been compared to Zeldris might still be a bit stronger. There is the assumption that 52K Meliodas flames are capable of vaporization since they are similar to Estarossa, who is stronger than the latter. High 7-A -> High 6-C. I think is better to wait for others to respond about this. Plus Chandler was probably low on magic to begin with, having just come through the Goddess Seal. He doesn't contradict the upgrade. Anyways I agree with the upgrade, I've thought for a while now that NNT had too strict standards placed on it while Naruto's Bijuu got vaporization just because a cloud was drawn in a panel. I agree, also yay Country level NNT, good find. If this goes through than there is going to be a lot of Country Lvl NNT characters. Indura can be at least low 6-B possibly higher. You have to consider many things, she was confident she can take on the Ten Commandments, she is highly respected by sariel and tarmiel, like if you notice their dialogues they talk to her as if she is some sort of superior, ( which is what I added), also she did send him a far distance away before he could successfully counter, and she managed to injure deriere. Also! Sariel and tarmiel was surprised Estarossa didn't get hurt after taking her arc, they did " top demon or not" implying she posses great threat to all of them. Oh and she had no intention of fighting Estarossa, just wanted him gone. That's why Estarossa should be at least and she solid low 6-B, I'm not implying she's stronger for sending him away, but it's a feat. Oh! And she protected derrière of all people lol. When you look at everything, she is likely above the commandments that aren't Estarossa, zel, and Mel. Well he cut tarmiel in two, so for anyone that scales to 40k galan I think they should get likely low 6-B, tarmiel and sariel are > mon and derrière. But he isn't on their level, but I think At least high 6-C, likely low 6-B should be fine. Right now I put him at likey 6-C, instead of a solid 6-C.
Alright so anyone thats close w/ Galan 40K should be At Least High 6-C, Possibly Low 6-B, Anyone around Elizabeth (stronger then Galan) should be At Least High 6-C, Likely Low 6-B or just Likely Low 6-B, anyone around Estrarossa level should be Low 6-B, anyone thats stronger than Estrarossa (weaker then Meliodas) is At Least Low 6-B, and Meliodas could either be (1). At Least Low 6-B+, (2). At Least Low 6-B, Possibly/Likely 6-B or just plain 6-B. Not really sure about this since he uses Darkness pillar rather than Hellblaze to do so, but I personally don't mind the upgrades, they seem not too extremely inconsistent with a few other calcs of this league. Like an amped Zeldris withstanding an explosion that was calced to be at this level (i'll find it later). It's extremely high end, so i agree with the scaled characters, with the possible exception of normal Galand, though i think he'd definitley scale. Found the calc, Kep says it's usable. It would also scale to specifically Shel and Zel, though the latter likely was weakened by the attack since it's holy magic. Found the calc, Kep says it's useable. Can u guys look at what i said and see if its good or needs any changes? Though there was no comment after the 13th of January. Elizabeth normally could be around those levels, but she has blasted the skin off Derieri's arm with a Holy Magic Blast, and when her powers started to grow after remembering her old life, she could hurt Meliodas in his Assault form with Holy Magic. Also, in a previous incarnation, she was portrayed as comparable to Demon Meliodas (the one who's base was 60k), and she could force Derieri and Monspeet's indura forms out with Sariel and Tamiel's help. As mentioned, the latter two feats are with Holy Magic, which does weaken Demons. The rest i generally agree on, and i can give a sort of scale if needed for the tiers around or above Meliodas' Assault form if you require. It seems like Dark649 disagrees about this. By the way, since we can't see the Earth from space, this is unusable. That's what I saw. I could be missing something, but where did he say it's usable? @Burning I was a little tired and saw unusable as usable. My mistake. @Ant Dark disagreed before because he thought Chandler used up over half of his magic power for a High 6-C meteor feat while amped. Though we later explained that Chandler actually did it casually while being severely weakened by the goddess seal with an unknown amp at night. Right now he’s only iffy on if the flames that Meliodas used is capable of vaporization since they are similar to Estarossa’s flames. So right now Dark is actually more or so neutral but leaning more towards disagreeing on this. Can you write a summary of what specifically that you wish to change? Anyone thats close w/ Galan 40K should be At Least High 6-C, Possibly Low 6-B, Anyone around Elizabeth (stronger then Galan) should be Low 6-B or just, anyone around Estrarossa level should be At Least Low 6-B or Low 6-B+, anyone thats stronger than Estrarossa (weaker then Meliodas) is At Least Low 6-B+, and Meliodas could be At Least Low 6-B+, Possibly/Likely 6-B or just plain 6-B. As mentioned, they do have to be particuarly strong, like Nerobrasta couldn't kill Derieri just because she had that magic, just break her hair down a little. @BlackeJan actually 56k Meliodas did the Low 6-B+ feat and Derieri is comparable to him and Elizabeth damaged her so she’s also Low 6-B+. Characters like Estarossa are probably At least Low 6-B+. While characters like Ludoshel is probably At least Low 6-B+ Likely 6-B. I wasn't contradicting your list above (which is solid), just replying to another comment. Naw yur good i was just berating myself since u said it in plain sight. Demon Meliodas before he died the one that had trouble with Derieri did the Low 6-B+ 5.2 Terraton feat. Has this been accepted though? Isn't there the possibility that his Demon form at the time doesn't scale to his normal one, it was out of control after all. Well his current profile is scaled to that feat so. Well since we don’t know if this is accepted yet. Let’s make a list on what are the characters new tiers going to be. Not for everybody. The list I’ve seen on this thread are still missing quite a lot of characters like Ban and Elaine and some characters Sariel and Tarmiel need a new update after the new spoiler summary which said they stomped Eatarossa. Not to mention I’m pretty sure some of the characters like Ludoshel can be At least Low 6-B+ Likely 6-B since he stomped four commandments at the same time two of which should be Low 6-B+. That base Meliodas (60k) would scale to Estarossa who also has a power lvl of 60k so At least Low 6-B+ according to Raven’s list. I’ll probably make a list myself after class is over. Well, if you want to use vaporisation values for a preexisting calculation, but only the pulverisation values were previously accepted, you would need to make a note in the blog post about it. However, I am very uncertain about this. We probably shouldn't assume that two different instances automatically worked in the same manner, regardless of evidence. Ban isn't stronger than current Gowther. He managed to take half of Galand's power, current Gowther is sitting at 35k and has mind hax on top. @ ant well we have better evidence that vaporization can actually be used, and this is consistent with other higher tier feats like low 6-B and high 6-C, we should change it to high end since we have better evidence now, and it can be used to support NnT chars being stronger than what is listed on their profiles atm. Are there any calced feats that put them at high 6-C? His profile should be changed because it says he is 6-C.
Ok, now I have gone back and read the full context of what happened with Chandler. Chandler did not use his meteor attack after he became affected by the attack from King and Gowther, but the narrative did suggest that he wasn't as powerful as normal due to the Goddess seal when he did. This a process just like with the Ten Commandments that they had to fix by absorbing demon souls. Unfortunately, Chandler hadn't done any of that and had gone straight to reclaim Meliodas. On this thread of the same topic, the OP presented evidence to suggest that we could use the vaporization values for Meliodas' destruction of Danafor. I agree with the upgrade based on the evidence shown, but it would be beneficial to have someone from the calc group take a look at it. No upgrades are going to be performed unless the calc group accepts this. Endlessly arguing back and forth is not going to make any difference. I will unsubscribe from this thread now. I will make a thread for the calc members soon however i want to bring notice to something else that gives an upgrade regardless. Someone should just notify the Calc Group and let them analyze the information we have. As others said, arguing semantics doesn't really make any difference unless it is accepted. Did Reaper bump it in the calculation thread? Yeah, I agree with upgrading them. Yeah I notified them, what are your thoughts on this? So whats the Tier for that attack? Roughly a bit over 2.5x baseline 6-B. It seems a bit too high though. I don’t know anything about calcs. But meteorworks being 6-B seems like a really big outlier considering it’s Base Chandler that did this in a heavily weakened state. the picture in question obviously does not showcase the craters from the meteors. they are simply craters from the battle. im indifferent towards anything going on in this thread as i have not checked it. but trying to scale battle landmarks in close proximity to each other where you see chandler standing right next to it as "meteor craters" is an absolute no go and lowers the credibility of any potential upgrades. i suggest everyone reads the chapters 236 to 240 to understand it. Well at least we still have Tarmiel’s ocean grace feat that Dodonova is going to calc when the English subs of the next chapter come out. no problem. if i sounded harsh i apoligze. when i re-read my post it struck me that it may could be seen offensive. in regards to all the calculations in question here and if they are valid and could be used its best to ask a calc group member i suppose. also i am eager to see the results of the new feat as well, yes. These are the craters right after the attack, a few more craters from the meteor attack and not them, and still some more, even more. You can also see here that the craters are rather small. The environmental damage mostly doesn't even add up with making the craters, or is mostly after, there's also far too numerous craters. Of Course Chandler isn't next the craters, he was blasted away minutes ago, but he's extremely close. I'm gonna calc the sword swing though. he stands right next to them when he swings his sword. I know he's there, i thought you meant something else. I am quite tired. Did any of the calc members find this yet? I've requested the Domain of God Dimension calc, it probably only scales to Tamiel and Sariel, or it might not. I did a version here using the size of the Arctic Ocean. It is most likely too high unless the other upgrades are reviewed and accepted though. I still fail to see why the upgrades weren't a one-and-done type situation. The cloud of vapor qualification was fulfilled even more than it was for other verses to justify an upgrade, and then it was even further supported by Estarossa's Black Hound, which burns, giving us the same type of vapor. And it doesn't create any inconsistencies because it only scales to the high tiers of the verse. I Bumped my evaluation request again hopefully it helps. I also agree this is pretty straightforward. Pretty much the only argument we got is that it might mess up the scaling due to Chandler's feat, which was addressed. Meliodas Danafor Vaporization, Chandler Meteors and Samiel/Tarmiel Ocean feats needs to be evaluted, i can handle the scaling. Yes, now we have 2 made level country and one that is between level country and level continent, seems solid to me. I look forward to the evaluation of the calculation group however. i heard rumours about the godesses attacks disintegrating their opponents on the molecule level. depending how that plays out i might calc Ruedociels OmegaArc disintegrating 10K demons. gonna wait for confirmation before i lift a finger tho. RavenSupreme wrote: i heard rumours about the godesses attacks disintegrating their opponents on the molecule level.